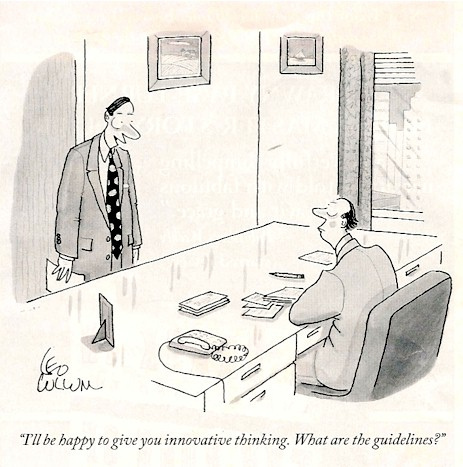 Innovation in Outsourcing – Oxymoron? Based on a 2011 Gartner study, numerous website and industry blog postings, and almost every executive I’ve spoken with, it seems that innovation continues to be lacking in outsourcing relationships. All companies want it, all providers promise it, and no one is happy with the actual results. Defining Innovation: Think of this as a college essay – “what does Innovation mean to me?” Like other buzz words in outsourcing (all together everyone say “Governance”! ), Innovation means different things to different customers and providers. Defining “Innovation” in the outsourcing contract helps to ensure that everyone is on the same page. (For an additional perspective on different types of innovation, refer to a blog by Douglas Parker: “Innovation in Sourcing Relationships – The Pieces and Parts“). Developing and Executing an Innovation Plan: Once Innovation is defined and agreed, develop an “Innovation Plan”. If defining Innovation provides parties with the agreed destination, the Innovation Plan provides the roadmap for getting there. Outsourcing agreements should document and track Innovation initiatives – but this obligation should not be, and really cannot be, one sided. A provider cannot develop an Innovation Plan for a customer’s business without active participation by the customer. So make sure to craft the related contractual provision realistically – if the customer is not engaged and invested in the process, the Plan is unlikely to be relevant or achievable. Rewarding Innovation: If Innovation is one of the primary drivers or objectives of an outsourcing strategy, then the customer will be well served by structuring the right incentives for achieving the objective. It is unrealistic to think that a provider will invest time and resources to “innovate” on a customer’s behalf without receiving some sort of compensation for its efforts. Thinking through how to create a “win-win” for both the customer and the provider is critical to having both parties committed to the innovation process. But these three principles are really just an extension of the fundamental tenets of a successful outsourcing deal – mutually agree on expectations, track performance against the expectations and compensate the provider appropriately for providing a “service” (in this case, Innovation). So why is it that Innovation in outsourcing remains so problematic? In my experience, two factors persistently create roadblocks to Innovation in outsourcing contracts — the pricing model and the level of control retained by customers. Road Block #1 – Ineffective Pricing Models: A common approach to pricing outsourcing contracts is to define the “cost drivers” and then develop a pricing model that compensates providers based on those cost drivers. However, when a provider is compensated based on such a pricing model, the incentive to Innovate may actually be reduced. Let’s take an example from the health care industry. A primary cost driver for a provider performing claims processing services are the personnel costs (i.e., man hours). An outsourcing agreement for these services might therefore commonly be priced on either an FTE basis or on a “per manually processed claim” basis, each of which in effect compensates the provider for the amount of time its personnel spend processing claims. Although there may be benefits of using one of these pricing models – namely that they provide flexibility to address fluctuating demand – neither one actually creates an incentive to innovate. If the provider is paid based some measure of the number of man hours or on the number of manually processed claims, why would that provider invest in innovative solutions that result in a higher auto-adjudication rate? II laughed when I first saw this cartoon …. and then realized that this is exactly what happens in most outsourcing agreements! Over and over, customers say that they want Innovation, and then the same customers say (in the same breath, sometimes) that they want to be able to dictate, to varying degrees, how the provider will perform the services. Perhaps customers should ask themselves: “Which is more important to me, knowing and being able to control how the outsourced work is performed or being flexible and open to innovation that might provide me with significant improvements in performance or lower cost?” The more willing one is to be specific and strict on desired outcomes and flexible on the process to achieve these outcomes, the more likely that the provider can and (with the proper incentives) will seek innovative ways to deliver the services and meet the target outcomes. In the end, there is no simple formula or decision criteria for determining the right balance, but each deal and each customer should carefully consider the trade-offs and determine the right balance at the outset so that the deal is structured correctly. To recap, I do not mean to suggest that Innovation cannot be an integral part of an outsourcing relationship. Indeed, it is often cited as one of the long-term strategic reasons for outsourcing in the first place (i.e., harness the innovation of providers with greater knowledge, focus, and skills in delivering these services). But I do think that experience has proven that customers, providers and sourcing advisors need to think a bit more critically (and dare I say, creatively) when structuring the solution and preparing contractual provisions in outsourcing agreements that foster Innovative behavior on both sides. This is very interesting story about outsourcing Oxymoron. I agree with you that it has some merits as well as problems.